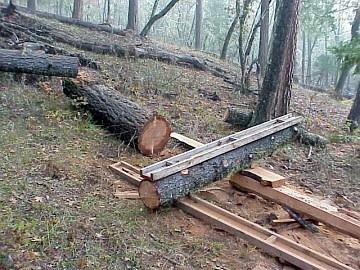 The short guide rail is attached to the stabilized log. For cutting beams the guide should be at least two feet longer than the length of the beam to be cut. 10 feet for 8 foot long beams is good. I use the 18 foot long guide for anything over 8 feet in length (seen supporting the lower end of the log). I usually try to lift one end of the log up higher when milling. Working downhill or flat is very helpful.